What are the solar power pros and cons? 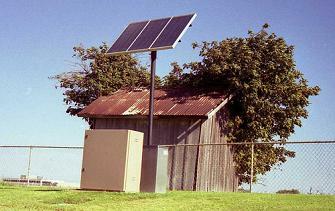 In the balance, is solar power a good thing, or are there hidden costs we’re not considering? Is the embodied energy in manufacturing solar electric arrays more than the solar cells will produce? Let’s look at the advantages and disadvantages of solar power and see how solar power stacks up. Solar electric and solar heating systems (and even solar air conditioning systems) give some measure of autonomy to the buildings and people using the systems. You don’t need a connection to any utility service to use them, so you can install solar power in remote locations such as cottages, mountain cabins, or in locations where the cost of bringing in the utilities is excessive. Even if it costs more to install a properly sized solar electric system than to bring in the electrical lines to a remote location, solar electric systems can still make sense, because once the system is installed you are independent and never have to pay utility bills. Solar electric installations, depending on the rules of your local utility or government, can pump some or all of their power back onto the grid. This can either cut your energy bills, or in some cases earn you money at a much higher rate per kilowatt hour than you pay for the electricity you consume. You may also be protected from utility power outages, depending on how your solar electric system is configured. Solar heating installations give you autonomy from the utility that would otherwise provide you with heat. If your existing heat source is electric – often a very expensive way to heat your home – solar heating can help protect you from winter power outages. It’s unlikely you’ll ever see an interruption in gas supplies, but for those heating with oil, solar provides a welcome relief from waking up frozen in the middle of the night and discovering your oil tank has run dry. Pros: Clean, green energy. Cons: A bit cramped! First-world or developed countries have become increasingly dependent on energy sources from politically unstable and unsavory areas of the world. By moving more of our energy production to solar power, we reduce our dependence on these unstable political regimes. Solar power also keeps more of our money in our own economies, instead of sending it to regimes who may use it for their own, sometimes questionable ends. Solar heating is very efficient in terms of cost per unit of heat output, because once the system is installed it operates basically for free. Solar electric power modules are continually improving in efficiency, with PV modules once at 4-6% now pushing up into the teens, and some large-scale solar thermal installations going considerably higher. Asking the efficiency question about solar energy without factoring in the money is kind of irrelevant. A 1% efficient PV cell sounds awful, while a 30% efficient PV cell sounds wonderful. But if the 1% cell can be made at 1/100th the cost of the 30% PV cell, we may be better with the 1% cell. It’s just a question of finding a big enough area for enough 1% efficient cells to generate the energy we need. Solar electric installation in a home is either preceded by, or soon followed by, increased energy efficiency in the home. The occupants become much more aware of their energy consumption, and the high cost of additional solar electric capacity, versus the low cost of conserving, motivates people with solar installations to conserve much more than those connected to the grid. One efficiency consideration of solar power is its reduced output on cloudy days, and its complete lack of output at night. But these limitations are being overcome with new technologies, such as heat capture in solar thermal generation, where heat from the hottest part of the day is stored, and then used at times of cloud cover or darkness to generate electricity from the stored heat; improved batteries both at the household level and on a larger scale (for example, using large flow batteries, which can store huge amounts of electrical power with minimal power losses for a few hours). Solar energy is 100% renewable and clean. There are no CO2 emissions contributing to climate change when you generate electricity, or heat or cool your home with solar energy. There are no acid rain emissions (from nitrous oxide or sulphur dioxide such as we find from burning coal). There is no mercury released from solar energy, unlike from burning coal or from large-scale hydro-electric reservoirs. Solar energy does not cause oil spills off the coast of Alaska, or sour gas flares at refineries, or contaminated waterways in Third World countries with few or unenforced environmental regulations. Solar energy is a form of nuclear energy – since the nuclear reactions in the sun are sending light our way and powering our solar electric panels and solar heaters – but fortunately the nuclear waste from that reaction is safely stored 93 million miles away. Nuclear facilities on earth, on the other hand, have never found a permanent, safe repository for their waste, which remains highly radioactive for hundreds of thousands of years, and which can be used as the fuel for an extremely powerful and destructive weapon in the hands of terrorists or aggressive governments. You can generate solar energy where it’s needed. You don’t need huge, centralized plants such as those producing electricity from coal or nuclear, or huge dams, or giant wind farms (not that I have anything against wind farms). Solar energy can be, and often is, intensely local. You can power your own home with your own solar panels – cutting transmission losses, which account for up to 9% of electricity generated in the US. Solar panels, both electric and thermal, operate silently and motionlessly. There is little visual disturbance from them (they can even be built into your house as solar roof shingles) and they cause no disturbing noise. You can start with a small solar installation and grow it as your needs grow, or as you are able to set aside more money for additional capacity. You can start today with a solar water heater that boosts the input temperature to your tank, and later add an extra panel to cut your hot water heating costs. You can put one PV panel up and do a grid interconnect to generate a kwh or two of electricity a day – make a few cents off the utility each sunny day – and later add more panels, as the price per watt or panel falls and the government adds more financial incentives to encourage people to install panels. Solar power has a high up-front cost, but no or very few ongoing operating costs. Once the system has paid for itself by cutting your utility bills, money saved after that means more money to spend on things other than energy. Your energy source is free, yet can indirectly or even directly produce an income for you. There are many financial incentives to encourage you to install solar electric or solar thermal systems. Incentives in the form of grants, rebates, tax credits, and buy-back of power you generate, are available in different cities, states and provinces, and countries – in most places in developed countries there are at least two or three programs a homeowner can take advantage of. These incentives can turn a very high cost investment with a long payback period into an affordable investment that pays for itself in just a few years. You can sometimes even sell your energy back to the grid for more than you pay for the energy you consume. For example, in my home province of Ontario, Canada, the provincial electrical utility, Hydro One, pays about four times as much for the solar power you generate, as you pay them for the electricity you consume from the grid. You actually have two electrical meters – one for the power you consume, and one for the power you generate. Solar heating is cost-effective already at today’s fuel prices (oil and natural gas, and especially electrical heating). And if fuel prices rise, solar heating becomes even more affordable, relatively speaking. While your neighbors cringe at their increased gas or fuel oil bills, you’ll be paying nothing to heat your home. Solar energy saves money not just for you but for the society you live in. By cutting the amount of greenhouse gases and other pollutants you release, through a switch to solar energy, you help reduce the future societal costs of climate change, and the current costs of treating countless sufferers of asthma and other respiratory illnesses, whose health is adversely affected by some other sources of electricity such as coal power. Solar electric systems have no moving parts, and solar heating systems have very few moving parts if any (a fan or two on occasion) so they can last for decades with minimal maintenance. Solar systems just quietly do their job. No lubrication, no parts replacement, no noise, no noxious fumes. You can use solar power in places where bringing in a gas line for heat, or an electrical utility line, is prohibitively expensive or impossible or environmentally destructive. Solar panels can go just about anywhere – even in space, which was one of the main early uses of photovoltaic panels. Because solar electric systems are highly localized, they can help cut down on the most harmful form of electrical lines, high voltage lines and step-down transformers, both of which have been shown to have adverse health effects to those living near them. If you have a rooftop, you can install a solar panel. If the sun shines in your area for more than a few hours a day, a solar panel can help heat or power your home for part or all of the year. There are vast areas of land that are pretty much uninhabitable (such as the deserts of the Sahara or the US southwest or the Australian Outback) but where the sun shines brightly for hours each day. These locations are excellent for installing massive solar electric capacity. The up front cost of solar energy, especially solar electric generation, is prohibitively high if you don’t have any financial incentives available to you. This is partly because the financial incentives offered in some countries and states, along with an increased interest in environmentally minded consumers, have created a surge in demand for solar electric technology. It is also in part because silicon-based solar cells are competing with the computer industry for a small supply of computer processor grade silicon. Several new solar-specific silicon manufacturing plants are coming online that will reduce the cost of silicon-based solar cells, and several new photovoltaic technologies are gearing up, so the cost should continue to drop. Remember that while the cost per cell or array keeps growing, the cost per watt has actually fallen, because the capacity of each cell or array keeps improving. Solar electric power needs sunshine! When the sun hides behind a cloud, your solar output drops to a fraction of its peak, or down to zero. When the sun sets, you don’t generate any power. So you either need a storage system such as batteries, or an alternate source of power, for example through a grid interconnect. Solar panels are also subject to shadows from surrounding buildings and trees. This is why hiring a local solar expert to help you do a sight assessment is so important. Doing your own assessment, you may miss a tree off in the distance that appears not to be a problem in June, but that in September or November will cost you 30% of your potential output. 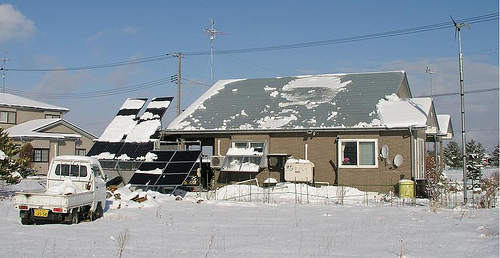 Solar panels don’t work when they’re covered in snow! You will have to get up there and clean them off now and again when snow or ice builds up on them. Solar panels can take up a lot of space, if you go in with the attitude of supplying your current usage with solar electricity. But if you are careful to cut your electrical use first as much as possible, you can go a long way to addressing this disadvantage of solar power. The fact that the sun moves through the day may cause solar electric panels to get well below their maximum possible output – since only panels directly facing the sun will achieve that output, and stationary panels will only face the sun directly for an hour or two each day. The seasonal changes in solar angle also mean that a fixed solar panel will not be angled towards the sun except for a short part of each year. Again this reduces the capacity of the solar panel. Both of these cons of solar energy can be solved to some extent through technology that moves the panel through the day, tracks the motion of the sun, or, for seasonal solar angle, gives you several positions to move the panel into at different stages of the year.